Near here are graves of pioneer whites caught up in the conflict between native Americans and white settlers. On July 24, 1867, Indians attacked the home of Peter Campbell near here. Campbell and his eldest son were helping a neighbor with his harvest. The Indians, Sioux and Cheyenne captured two of Campbell's daughters, aged 17 and 19, and his twin sons, aged four. A nine-year-old daughter escaped. The Indians killed Mrs. Thurston Warren at her home a half mile away and wounded one of her children. In mid-August of that year, the Pawnee Scouts, led by Frank North, fought a Cheyenne band near Plum Creek and took a woman and a boy prisoners. The boy was a nephew of Turkey Leg, a Cheyenne Chief. A month later, a meeting was held in North Platte between a government peace commission and Sioux and Cheyenne leaders. Turkey Leg recognized Major Frank North, commander of the Pawnee Scouts, and offered to exchange some white prisoners for the two Indian captives. The children were exchanged unharmed in late September, 1867, at North Platte. The following spring the Campbell family moved east to Saunders County for safety. 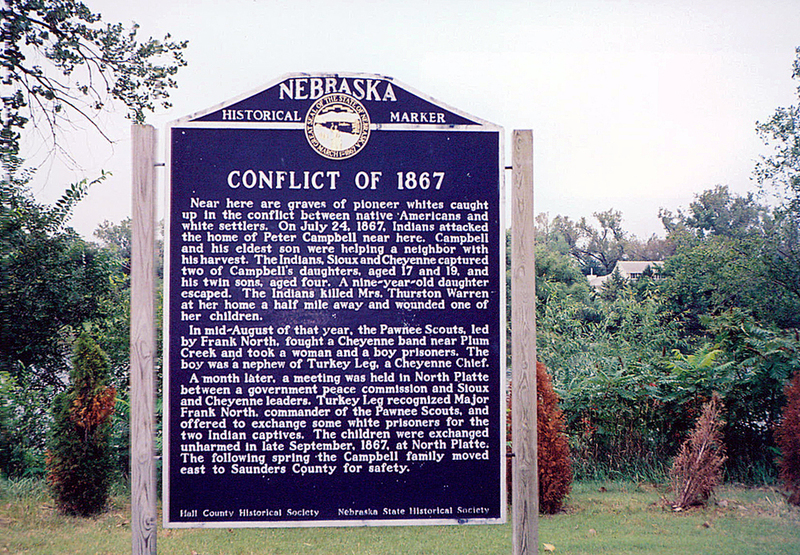 “Conflict of 1867,” Explore Nebraska History, accessed April 18, 2019, https://mynehistory.com/items/show/254.